Let’s face it, if you are coming to holiday in the Margaret River Region then you’re surely going to visit a winery or two! While ‘down south’ in the Margaret River Wine Region you must taste at least one of the region's famous wines - we love our Cabernet Sauvignon, Shiraz and Chardonnay! The Margaret River Wine Region is magnificent, it is so diverse which means you can find a wine and winery to suit everyone. There are wineries with cellar doors, restaurants, cafes, winery experiences, wine & food flights, farm tours, animals, history, playgrounds, beer, galleries and picnic facilities! The Margaret River Wine Region really is an adults playground. To help you choose where to visit, we have put together a list of our favourite places. Settlers Liquor Store offers a great selection of local Margaret River wine, beer and spirits. Located right in the centre of Margaret River town, it is a great stop to stock up ready for a dinner at home in one of our holiday houses. TIP: This bottle shop often has in-store wine tastings from local wineries on Friday evenings from 4-6pm - where you may be lucky enough to meet the maker. Amato Vino produce small-batch artisan wine following a ‘lo-fi’ philosophy where they embrace wild-ferments, minimal adjustments, gentle handling and most wines are unfined & unfiltered. Check them out at the very convenient Urban Cellar door which is open for tastings & sales every Thurs/Fri/Sat between 11am-4pm at the Margaret River Collaborative. TIP: This is a great one-stop-shop in town, with the Collaborative providing a coffee shop and local products & gifts - drop in after lunch at the famous Margaret River Bakery! You can also taste many local wines at most of the restaurants in town. Settlers Tavern has an award wining and extensive list - ask for it at the bar. Stella Bella is just 10 minutes drive from town. We love their charming cellar door and range of different wine brands. TIP: They have some great wine glasses for sale in the cellar door to complement your Margaret River wine purchases. Redgate Winery is a great winery to visit on the way back from a morning at Redgate Beach! We love a lazy afternoon in the sun at Redgate Winery. TIP: Pack a picnic! After you have finished tasting their wines at cellar door, buy a bottle of wine, set up on one of the picnic tables and enjoy a glass of Reserve Chardonnay with some local cheese while taking in the view over the vines & down the valley. 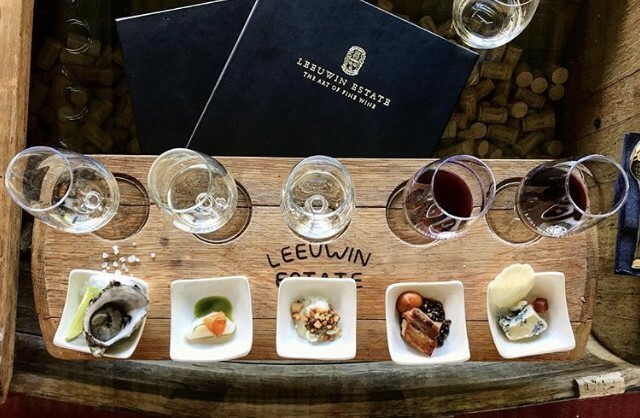 Leeuwin Estate offers a restaurant, cellar door and Art gallery. This family run sprawling estate winery is only 10 minutes from Margaret River town. TIP: We suggest enjoying a long lunch on the deck, attend an alfresco summer concert or indulge in a wine & food flight and taste your way through their famous Art Series wines. You can pop into Voyager Estate on the way passed, they have an amazing wine room - look out for their giant flag! Cape Mentelle is one of the ‘founding five’ Margaret River wineries and the history here is amazing. Wine industry pioneer David Hohnen and his brothers Mark and Giles established Cape Mentelle Vineyards in 1970, just after Vasse Felix in 1967 and Moss Wood in 1969. TIP: Book a Behind the Scenes wine tour or check out the summer Movie programme and enjoy a glass of Chardonnay or Shiraz while you sit back on your bean bag and enjoy a blockbuster under the stars. Arlewood has been a Margaret River producer since 1984 and in 2009 they moved their headquarters to the cooler sub-region of Forest Grove, just 10km south of the Margaret River township. The cooler site allows them to produce wines that are fragrant, elegant & complex. TIP: The cellar door staff are particularly friendly, so stop by and if you catch a fine day you can enjoy a tasting on their newly built deck. Try the Chardonnay and Villaggio Red - a great table wine. Glenarty Road is one of our favourite winery experiences! Glenarty Road is a boutique farm and vineyard based in Karridale. They focus on making world-class wine, growing fresh seasonal produce & raising grass-fed lamb. The rustic building is a treat for the eyes. In the right season you can bottle feed the baby lamb and there is a resident cat, dog and galah! TIP: Go here for their Sunday roast, a glass of wine & cheese board for dessert - make sure you book! Vasse Felix is Margaret River’s founding wine estate and was established in 1967 by regional pioneer Dr Tom Cullity. If you are up this way, it really is a must visit winery. The Estate offers wine tastings, an award-winning Restaurant, art gallery, tours and more. TIP: We recommend relaxing in the wine lounge where you can enjoy a glass of wine or wine flight with a charcuterie and cheese board. Flor Marche is a pottery gallery and wine tasting experience in one! Flor Marche’s cellar door is inside the gallery area of Willyabrup Dreaming, where local potter Bill has been crafting pottery for more than 20 years and has an exciting range of ocean inspired pieces. Small batch natural winemaking sourcing parcels of fruit from single vineyards across the southwest of Western Australia, so this wine will be different to others on offer in the region. From here there are a number of great wineries within a stones throw of each other along Caves Road - this is where we leave you to follow your nose…and palate!